Andrew Sentance is the (only) son of Bill and Lillian Sentance, who were both born in Grantham in the early 1930s and were married in 1955. They have returned to live in the town in their retirement. 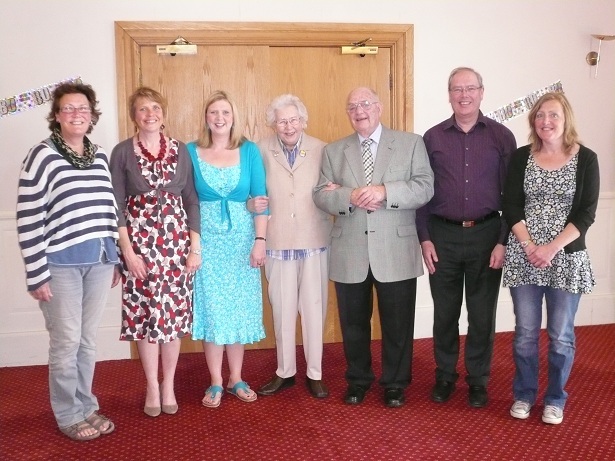 Andrew has four sisters – Tricia, Sue, Mary and Rachel – and the picture to the right shows the family together celebrating Lillian’s 80th birthday in April 2011. George’s father was William Sentance (1842-1900) and his grandfather was John Sentance (1794-1852). John’s father was William Sentance (1769-1839), the son of Valentine Sentance (1741-1809) and the grandson of Broughton Sentance (b.1708). Broughton was in turn the son of another Valentine (d.1741). Valentine and Broughton are unusual and important names which link our Sentance family back to one of the earliest known Sentance ancestors who lived in Grantham in the 16th century – Christopher Sentance (1559-1616), even though the exact line of descent is uncertain. Click on the links in this paragraph or the buttons above to find out more about these different chapters in our family history. Christopher was born in Grantham in 1559 and married twice – first to Mary Flowers, with whom he had six children: Elizabeth; Richard (born c.1588); John (b. 1590 but died in infancy in 1591); Dorothy (b. 1592); Rachel (b. 1594) and Dinah (b.1597). Both Rachel and Dinah died in 1604, possibly of the plague which broke out in Grantham that year. Mary Flowers died in 1602 and Christopher married again – to Helen Elyot. They had three children – Thomas (b.1605), Christopher (b. 1607; d. 1617), and Henry (b.1608). Henry appears to have subsequently emigrated to the West Indies on the “Paul” of London , and from there travelled to Virginia , where he is mentioned in land registration documents from the 1650s and 1660s. In his will, Christopher is described as one of the “waits” of the town of Grantham. (St Wulfram’s Church, Grantham, is pictured left.) The word “wait” apparently referred to a town musician, who had special permission to play through the streets on certain occasions, soliciting money. In other words, he was a busker! Christopher’s son Richard married Mary Turnbull in 1613 in Grantham, and their son Thomas was born in 1615. They may have had other children. Mary died in 1670 in Grantham. Thomas Sentance married Ann Broughton in Great Ponton, near Grantham, in December 1655. We can’t be sure that this Thomas was the son of Richard and Mary, but it is certainly a possibility. Roger Sentance, who first researched the family history in the late 1970s, favoured this line of ancestry. Thomas and Ann are believed to have had two sons, Broughton (1656-1704) and Valentine (d.1741). However, it is also possible that Valentine was a son of Broughton’s – as we have no clear birth information for him, which may reflect the disruption to record-keeping created by the Civil War. Whether brothers or father and son, the families are clearly linked. Both men brought up their families in Great Ponton, where Thomas and Ann were married. In addition, Valentine has a son and a grandson named Broughton. Interestingly, Broughton (b.1656) was growing up in Grantham around about the time that its most famous son – Sir Isaac Newton – was graduating from the Kings School and moving on to Cambridge University . Broughton (1656-1704) married twice and had ten children, at least two of whom died in infancy. However, it is Thomas and Ann’s other son Valentine who is of most interest to us, as he is our ancestor. To continue our family history, go to the next page where you can read more about Valentine (d.1741), his son Broughton (b.1708) and his grandson Valentine (1741-1809). The names Valentine and Broughton link our family history back to Christopher Sentance in the 16th century. Though the line of descent is not exactly clear, Christopher’s grandson Thomas married Ann Broughton, and they had a son called Broughton (1656-1704). Valentine Sentance (d.1741) was either Broughton’ brother or his son. The fact that Valentine named his first son Broughton provides a strong link back to Thomas and Ann and hence back to Christopher. Valentine’s birth details are unclear, perhaps due to poor record-keeping during the Civil War. He married twice, initially to Mary, and then – after she died in 1721 – to Anne Tooley. From the first marriage there were seven children – Catherine (b. 1706), Broughton (b. 1708), William (b. 1711), Valentine (b. 1713), John (b. 1715), Elizabeth (b.1718) and Thomas (b.1720). Both Elizabeth and Thomas died in infancy, which may reflect Mary’s failing health. Valentine and Anne had a further daughter together – Mary, born in 1724. Broughton (b. 1708), Valentine’s eldest son, is our ancestor. And he certainly led a busy life! He appears to have eight children, with six different mothers, not all of whom he was married to! We are descended from his eldest son – Valentine – who was the second child from his first (and definitely legitimate!) marriage, to Rebecca Tomason. Broughton and Rebecca were married in London in 1738, at St Katherine by the Tower. Quite how Broughton ended up in London after his ancestors had lived within a few miles from Grantham for nearly two centuries is unclear, though the 18th century was a time of great economic change! He and Rebecca then moved back to the Grantham area. Valentine was born in Folkingham (about 10 miles east of Grantham), and the family eventually settled in Boothby Pagnell – about 5 miles south of Grantham, where most of Broughton’s other children were born. It is not clear when Broughton died, but his youngest child, Luke Sentance, was born in 1762 in Spalding (just three years after Broughton fathered a son Thomas in Boothby Pagnell!) However, our family story continues with his son Valentine, who had a more stable marital life! Valentine Sentance was born in 1741 in Folkingham, Lincolnshire, the very same year that his grandfather of the same name died. He was baptised on 11 September, and grew up with his family in Boothby Pagnall. It was there that he married Mary Essington on 6 November 1764. Mary was the daughter of Seth Essington and Anne Glenn. James was still alive at the time of the 1841 census – working as a labourer on a farm at Dembleby, near Grantham. William Sentance, the third child and the oldest son of Valentine (1741-1809), was born in 1769 at Boothby Pagnell, and was christened there on 15 May. He was born into a country which was undergoing radical social and economic change. In the mid-18th century, the industrial revolution got underway, but perhaps more significantly for the area around Grantham there had already been significant changes in agriculture and farming in the preceding century. Farming land had been enclosed, creating larger plots which could be farmed more intensively. Machinery was beginning to be used in agriculture – such as seed drills, ploughs, and later threshing machines. These developments allowed food production to continue to increase to sustain a larger population and to feed an industrial workforce. This process of change would continue through the remainder of the 18th and 19th centuries and would form the backdrop of the lives of William and his descendents. Grantham would become an industrial town, a thriving manufacturing centre for agricultural machinery and vehicles, linked to London and the industrial north by the Great Northern Railway in the mid-19th century. In 1801, Grantham had a population of just over 4,000 people. By 1841, this had doubled to over 8,000 and by 1871 it had tripled to over 13,000. William made his full contribution to this process of population growth, as he had a total of eighteen children by his two marriages, all but one of whom survived infancy! Changes in the system of agriculture around Grantham, and the pattern of employment opportunities, may also have been responsible for William’s moves early in his married life. William married Mary Taylor at Boothby Pagnell on 14 May 1793, and their first son John was born in 1794 in nearby Bitchfield. The next two children, Mary (b. 1796) and William (b. 1798) are born about 15 miles away to the north of Grantham at Hough-on-the-Hill. The family eventually settled in Barrowby, just to the west of Grantham, and now a suburb of the town. It had a rapidly expanding population at the time – with the number of inhabitants growing from 465 in 1801 to 799 by 1841. In Barrowby, William and Mary had four more children – Joseph (b. 1801), Ann (b. 1804), Charlotte (b. 1806) and David (b.1808). David died in infancy, less than a year after he was born. His mother Mary may have died from complications associated with the birth of David, as Willliam married Ann Winter in Barrowby in October 1808. William and Ann’s first child, Ruth, had already been born earlier that year, and the couple had a further ten children together in Barrowby over the next twenty years: Sarah (b. 1810); Valentine (b. 1811); James (b. 1813); Richard (b. 1815); Rebecca (b. 1816); George (b. 1819); Thomas (b. 1821); Michael (b. 1823); Robert (b. 1825) and Charles (b. 1829). William died, aged 70 in 1839, and was buried at All Saints Church, Barrowby, on 23 May. Ann continued to live with her younger sons Charles and Robert and died in 1858, aged 71. John Sentance, William’s eldest son, married Elizabeth Clark on 1st March 1829 in Sleaford, Lincolnshire. John Sentance was the eldest son of William Sentance (1769-1839). He was born in Bitchfield, Lincolnshire in 1794, and was christened there on 4th May 1794. He married Elizabeth Clark on 1st March 1829 in Sleaford, Lincolnshire. Elizabeth was the daughter of Arthur (1790-1867) and Sarah (1784-1866) Clark (sometimes spelt Clarke). Arthur was born in Aisby, Lincolnshire, and Sarah was born in Sleaford. 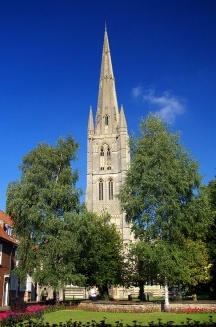 John and Elizabeth lived briefly in Sleaford where their first child Mary was born. They then moved to Harlaxton where their remaining nine children were born. John was an agricultural labourer according to the 1841 and 1851 census records. After John died in 1852 (buried – 24 August 1852), Elizabeth continued to live in Harlaxton which is where we find her in the 1861, 1871 and 1881 censuses, living with her son James (and daughter Eliza in 1861). Elizabeth continued to work, and gives her occupation as a nurse in 1861 and a charwoman in 1871 and 1881. Elizabeth died in 1883, aged 73, and was buried on 6 April. Mary was christened on 23 April 1829 at New Sleaford. She had a son, William, who was born in 1848 (father unknown). She had a very colourful married life. In 1850, she married William Dawson, who was ordained as a priest in the Mormon Church in February 1851. After William apparently deserted her, Mary married Henry Fox, and after he died, she married John Taylor in 1855. She subsequently married Charles Smith and lived in Sheffield until her death in 1909. Mary was christened 23 April 1829, New Sleaford. The 1841 census shows Mary working as a servant to William Woodhouse, a tailor, in (New) Sleaford. On 26 September 1848, Mary had a son, William, who was born at the Union Workhouse, Spittlegate (Grantham). No father is noted on the birth certificate. Mary married William Dawson on 2nd January 1850 at Scredington, south of Sleaford and east of Grantham. Both William and Mary Dawson were baptised into the Church of the Latter Day Saints (the Mormons) in early 1851 and William was ordained as a priest in the Mormon Church in February 1851. In the 1851 census, William and Mary are living with Mary’s son who has is now known as Samuel. (He subsequently used the names William and Samuel William throughout his life.) William Dawson, describes his occupation as a “priest” in the Church of the Latter Day Saints. On 8th August 1853, William Dawson emigrated – probably to the United States . The next month – on 18th September, Mary Sentance married Henry Fox, using her maiden name Mary Sentance, at the Register Office in Sleaford. Henry Fox is a husbandman, aged 23 years (a year younger than Mary), son of Richard Ellmore, living in New Sleaford. Henry Fox seems to have died before the autumn of 1855 as on 13th September, Mary marries again – her third husband in less than six years! Mary Fox, a widow, married John Taylor in the Parish Church of New Sleaford. The 1861 census finds Mary and John Taylor living in North Road, New Sleaford, with three children: William (aged 12), Mary’s son, who is described as John Taylor’s son-in-law; James and Mina – children from John Taylor’s first marriage to Mary Hall (who died in 1840). Mary’s son Samuel William was married on 29th January 1865, to Eliza Bell, in New Sleaford, and they have two children – Mary Ellen, born in late 1866 in Sheffield, and Charles William, born 12th October 1871, also inSheffield . In the 1871 Census, (Samuel) William and Eliza are living in the Upper Hallam district of Sheffield with their daughter Mary Ellen, aged 4. Mary can’t be traced in the 1871 census, but she re-emerges as a witness to the marriage of her brother William in Sheffield in February 1874 (see below), as Mary Smith. The 1881 census reveals that she is married to a Charles Smith, living in Sheffield . Charles was born in Heckington, Lincolnshire , near Sleaford. Living with Mary in 1881 is Charles William Sentance, her grandson, most likely the son of Samuel William Sentance and Eliza Bell. There is no record of Samuel William Sentance in the 1881 census, though his wife Eliza appears to be living with an Edward Taylor – a timber yard labourer – in the Brightside Bierlow district of Sheffield. though he subsequently reappears in the 1891 and 1901 censuses. In 1881, Mary Ellen Sentance, Samuel William’s other child, is working as a domestic servant in Warrington. She subsequently married George Forrest inWarrington in 1889 and the 1891 and 1901 censuses show they settled in Blackburn , but had no children. Charles Smith died in the 1890s and Mary is a widow (again!) in the 1901 census (though her age is mis-recorded as 63! ), living next door to her sister Elizabeth who is married to John Marriott. John is also the elder brother of Mary’s brother William’s wife Sarah Marriott (see below). Mary Smith probably died in Sheffield in the first quarter of 1909, aged 79 (death registered in Sheffield , first quarter of 1909). Charles William Sentance, Mary’s grandson, married Selina Pearson and they raised a family in Sheffield. Sarah Sentance (b.1831) married Thomas Scoffins in 1855 and they had four children – Ann (b. 1856), Elizabeth (1858-93), Emma (1859-64) and John (c.1862-99). Ann died on 21st February 1853, most likely as a result of complications following the birth of her daughter Jane, who was born on 27th January 1853. Ann died in the Union Workhouse, Spittlegate where her daughter was born. Jane was taken to live with her grandparents John and Elizabeth in Harlaxton, but died on 28th April 1853. The cause of death was given on her death certificate as “Debility from birth”. Jane was buried at Harlaxton on 1st May 1853. Emma was born in 1835 and was christened in Harlaxton on 25th October 1835. In both the 1841 and 1851 censuses she is living at home. At the time of the 1861 census she is working as a cook at a school in Sleaford. She married her brother-in-law John William Plummer in 1863. (John William’s sister Caroline was already married to Emma’s younger brother, Arthur.) John William was the son of Robert and Sarah Plummer, and he was born in Bitchfield – where Emma’s father, John, was also born. Emma and John William Plummer had one son, Robert, who was born in 1864. Emma died in 1867 (death registered at Grantham, Jun-Sep). John William Plummer re-married in 1868 (to Mary Chapman) and had a large family. Robert Plummer married Julia Jane Ellis in 1892 (registered in Grantham, Apr-Jun quarter) and they had eight children – Mary (b.1892), Frances (b.1894), Annie (b.1896), Elsie (b.1899), William (b.1899), John (b.1900), Walter (b.1907) and Leonard (b.1909). Mary Plummer married Samuel Wakefield and they had one son, Noel, born 1926. Noel married Jean Lunn. Their son Charles Wakefield married Susan Taylor, and Charles and Susan raised a family of four children in Boston , Lincolnshire in the 1970s. Arthur was born on 22nd April 1838 at Harlaxton and married Caroline Elizabeth Plummer, the daughter of Robert and Sarah Plummer. Arthur and Caroline had six children, but only two survived beyond their mid-20s – Emily (b.1864) and Charles Robert (b.1870). Arthur Sentance died in Grantham in 1919, aged 81 (death registered Jul-Sep). Eliza was born on 13th January 1840 at Harlaxton. She is living with her parents in the 1851 census, and in the 1861 census, Eliza and her younger brother James are the two children still at home with their mother Elizabeth in Harlaxton. Her occupation is given as a “General Servant”. Eliza died on 9th May 1861 of diptheria and she was buried on 11th May 1861. She was just 21 years old. William Sentance was the son of John Sentance and Elizabeth Clark. He was born on 13th May 1842 at Harlaxton. (The registrar’s signature on his birth certificate is Stephen Brice, who William’s sister Sarah subsequently worked for!) The 1851 census finds William living with his family in Harlaxton but by the time of the 1861 census he has left home and is working as a servant and agricultural labourer at Harlaxton Lodge. William married Eliza Marriott on 31st December 1868 in Knipton Parish Church – about 3 to 4 miles away from Harlaxton, just across the county border in Leicestershire. They were both illiterate, in that their marriage certificate has their mark rather than a signature. George Marriott, Eliza’s step-son, was one of the witnesses at the wedding. James Marriott and Eliza Gregg had married on 27 April 1851, also in Knipton. The 1851 census shows that Eliza had been a housekeeper in James’ house in Knipton, where he was living with his children from his first marriage (at Knipton in June 1828) to Elizabeth Bemrose, who died in 1848. The 1841 and 1851 censuses show James and Elizabeth had six children – William, Eliza, Henry, George, Mary and Enoch. George and Enoch were still living with Eliza in Knipton in 1861, along with the four children from her marriage to James. Less than a year after his wife’s death, William had married his step-daughter as she was expecting another child – John William, who was born on 22nd June 1879 in Harlaxton, Lincolnshire . On this occasion, William was named as the father on the birth certificate as he was now Sarah’s husband. Though William and Sarah had lived all their lives on the Lincolnshire/Leicestershire borders near Grantham, they were married in Sheffield , in the Parish of Wicker, on 3rd February 1879. This was probably because their marriage was not considered lawful under the eyes of the church, and possibly also the law – the fact that Sarah had been William’s stepdaughter was easier to conceal in Sheffield than if they had been married locally. William’s eldest sister Mary lived in Sheffield and she was a witness at the wedding. Following William and Sarah’s marriage and the birth of John William, the family appears to have spent some time away from their local area. The 1881 Census finds William, Sarah and their two children living at Bedwell Park Lodge, Little Berkhampstead, Hertfordshire. (Note: Sarah’s first child is still known as Sarah E Marriott, as she is also in the 1891 and 1901 censuses.) William and Sarah’s third child, Herbert Sentance was born in Hertfordshire on 29 January 1882. The whereabouts of the family is unclear between 1882 and early 1888 when Emily Sentance was born in Grantham (birth registered Jan-Mar 1888, Grantham). Other children may have been born in the mid-80s but did not survive infancy. James Arthur Sentance was born in 1890 (birth registered Grantham, Apr-Jun) and the 1891 census shows the family living in 1 Elton Street, Grantham, with William giving his occupation as a labourer. Frederick was born in 1892 and George, the youngest member of the family, was born on 11 February 1895. William died in early 1900 and the 1901 census shows Sarah as the head of the family, with all the children except Herbert still living at home. John William, aged 21, appears to be the bread-winner in the family, working as a “butcher’s man”. Sarah Sentance (nee Marriott) died in early 1915, aged 56 (though 57 is shown on the register of deaths). James Sentance was born on 18th March 1845 at Harlaxton. He lived with his mother Elizabeth, after she was widowed in the 1850s. He married Fanny Jackson, in early 1882, and they had one daughter, Lucy, born in 1882 a few months after they were married. James Sentance died in 1925, aged 79; it is not clear when his wife Fanny died. Elizabeth Sentance was born on 27th February 1848 at Harlaxton and, after a period in domestic service, she married William Dixon in 1876, with whom she had two children – Mary Elizabeth and Joe, aged 18 months. During the early 1880s, William Dixon either died or left the family and Elizabeth married again – to John Marriott, the older brother of William Sentance’s wife Sarah. John and Elizabeth had one daughter, Sarah Ellen Marriott, who was born in Sheffield in early 1884. Jane Sentance was born on 2nd September 1850 at Harlaxton and christened two days later. She was 7 months old at the time of the 1851 census. Jane probably died as an infant as she does not appear on subsequent censuses or other records.